This may not look like a Christmas project right off the bat, but it's a gift set I made for my sister last Christmas so I'm going to count it! 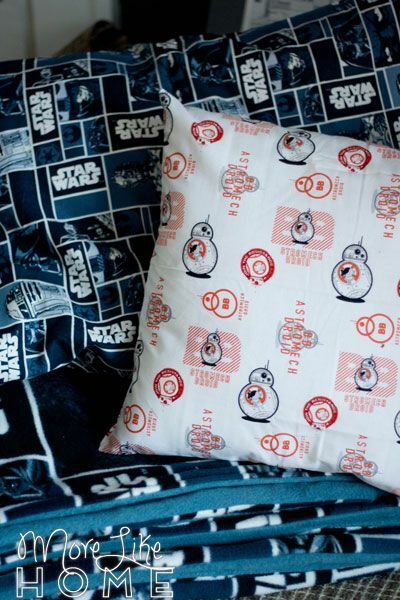 This is a great gift option to get bedding for your kids in whatever theme they like best without spending a fortune. And oh my goodness I just thought of this - you could make special Christmas bedding to pull out every December! P.S. Click the image below to see all our Christmas projects and DIY gift ideas in one place. 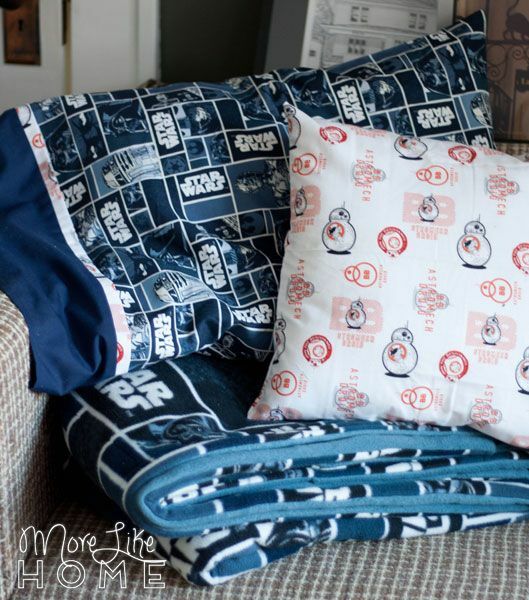 I followed a few different tutorials to complete the set - it includes a large fleece throw/bedspread, a standard pillow case, and a throw pillow. 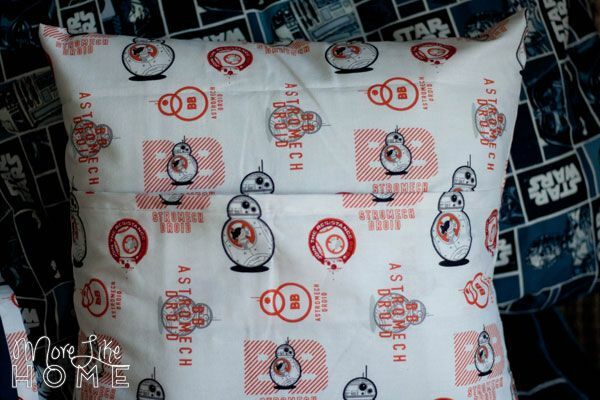 I used this tutorial to make the standard pillowcase in the darker starwars cotton fabric, with the accent band made from the BB8 fabric. The fleece blanket was really easy, and is the same technique I've used to make a few fleece blankets for us (tutorial here). They are our favorite because they are so warm and so BIG. I used matching Star Wars fleece for the front and lined it with a solid blue back. 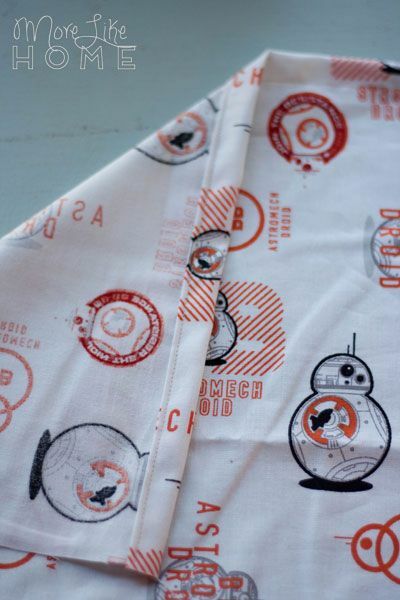 For the throw pillow I bought 3/4 yard of a fun BB8 fabric and a 16" throw pillow form. I followed the steps of this simple envelope pillowcase tutorial, but I'll go ahead and warn you my photography skills at that point were... developing. So I'll try to explain it here really quick, too. Start with a piece of fabric 17 x 41". Hem each short edge by folding the fabric 1/2" toward the wrong side, then 1/2" again to hide the raw edge. Stitch along the inside fold. 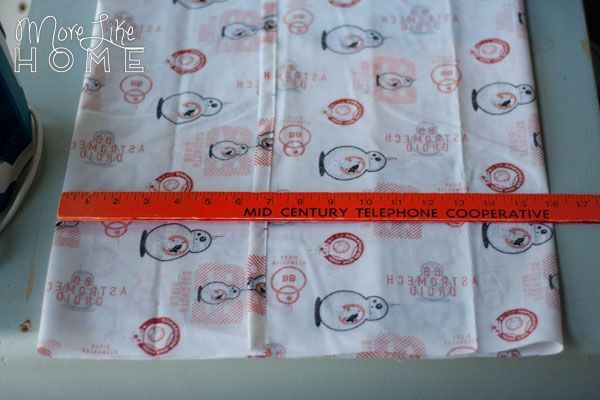 Lay the fabric face-up and fold both short ends in toward the middle, overlapping them about 7". The pillow case should measure 16" wide overall. Sew along the sides (top and bottom edges in the photo below) with a 1/2" seam allowance. Flip the pillowcase right side out and insert your pillow form. All done! That's it! I'd love to see what you make if you give it a try. 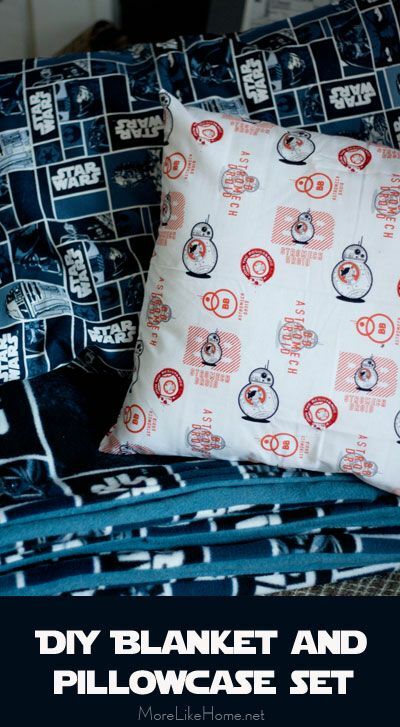 If you need me, I'll be making special Christmas bedding for the whole family.